Having traveled all over the world and explored many places, there aren’t many situations that put me on edge. Well, exploring the abandoned Six Flags New Orleans at night, by myself, definitely did just that. Back in 2005 Hurricane Katrina ripped through New Orleans and destroyed many things, and one of those things was the Six Flags theme park…aka Jazzland. The city now owns the property and there have been many attempts at renovating the park, but none have come to fruition. The city rents the park out to movie studios at a very expensive rate (last check was at over $50,000 for a 1-month lease). The park is a mecca for Urban Explorers. It’s the kind of post apocalyptic place that is so amazing…it truly looks like the set from the Walking Dead. I’ve had the opportunity to visit the park before purely to document the place. I don’t tolerate people damaging it, taking/stealing momentos, etc. Even though it’s abandoned doesn’t mean you have the right to destroy it. Observe, take images and enjoy….do NOT take away from this or any other abandoned place. ABANDONED URBAN EXPLORING WARNING: Many abandoned buildings are located in an area of town that is conducive to crime. There are usually wild animals inside the structures and it is possible that you can get busted for trespassing. Also, if you’re the kind of person that would sue a place for getting hurt…do not go there. There are dangerous aspects to this and any other abandoned structure including asbestos in some locations. I entered the park without breaking any locks, climbing any fences etc. Once inside the park the real challenge was not just to explore, but to capture it at night using a tripod and my Sony A7s. Two things I REALLY came to love about my A7s during my visit to Six Flags were the Silent Shutter and the amazing high ISO of this camera. The Silent Shutter enabled me to shoot, well, in complete silence. That’s important when you’re standing in a place that has wild animals, and could have some unsavory folks in there…especially at night. The key to making it a successful night were to go through there in stealth mode. Take my shots, don’t touch anything, and leave. The silent shutter made all of that possible for me. ISO Ranges of 320-3,200. Most of them at ISO 2,500. I ventured through the park taking my images and moving along at a good pace. At first I was a little on edge but after about 15 minutes once I had my process in place I got into a groove. My tripod was out, the silent shutter was working great, my camera settings were spot on…I was feeling good. About halfway through my time at the park I started to feel the need to quicken my pace and get my shooting done. Normally I’m not one to rush, but this was different. This is the kind of place that if you were injured, GOOD LUCK. If for some reason you aren’t able to get to your phone or you don’t have service…you are screwed. Make no mistake about it, there are risks associated with Urban Exploring. While some people love it, and others hate it…I will say this. Minors should NEVER do it. I continued onto the Ferris Wheel which I think is just gorgeous to photograph and while doing so I encountered some heavy rustling in the bushes. I know the park well enough to know there are most certainly alligators in the park. So again, that can put you on edge, especially given the fact they see better at night then we do. Armed with just a night vision camcorder (don’t want to use a flashlight and alert others where I’m at) I quickly left the Ferris wheel once I heard the rustling and continued to the other side of the park. I shot a few of the roller coasters, and then moved to the front side of the park towards the swings. The swings are one of my favorite parts of Six Flags New Orleans. Why? It’s because they represent the epitome of what the park now represents. 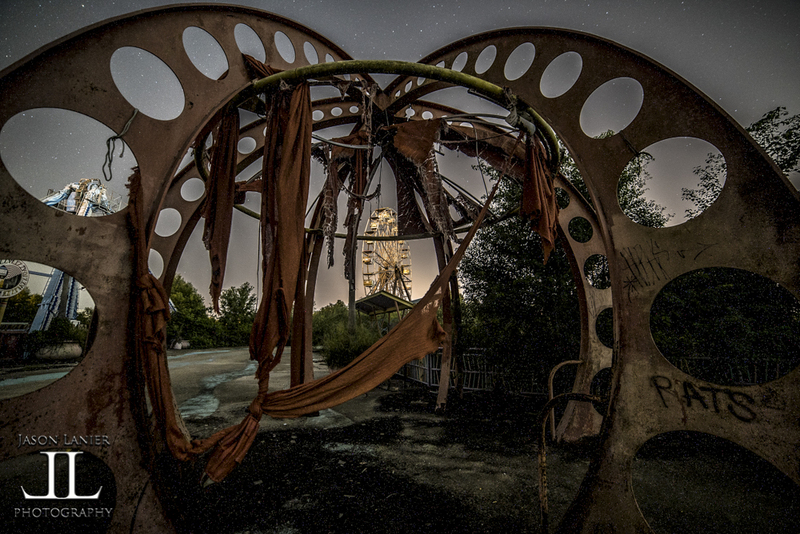 It shows the beauty of what the park once was, and shows the dilapidation of what it has become. It’s pretty sad to see the swings sitting there without any seats except for one or two. And for those reading this at home and haven’t watched the video…it was pitch black. Don’t be fooled by the shots you see on your computer screen. With the right camera settings you can turn any situation into a bright one…but it was D.A.R.K. I worked my way towards Main Street where I filmed a quick video using the Sony A7s at an incredible 204,800. While there is noise in the shot, it’s truly unbelievable to be able to capture anything at all at this high of an ISO. It’s funny to talk about after the fact while I’m sitting here at my computer writing this to all of you. But when you’re in there by yourself…you get VERY ANGRY at yourself for doing something so stupid…even though you really can’t avoid it because there’s debris everywhere and you can’t see much at all. So I walked out of the front part of the park, past the entrance gates and grabbed a shot of the exterior. One thing that can’t help but go through my mind when I go to places like this…is I like to imagine what the place was like when it was in full operation. Music playing, kids screaming, teenagers flirting, parents spending all their cash. It’s kind of crazy to envision all of that when you’re standing in the middle of it all. They even still have the lockers there that visitors would have used to place their belongings. It’s very surreal. I packed up my gear into my backpack, put my tripod away and started walking out to the exit. I then saw this old road that lead into the park and had a sign there that was warning people not to come in…but it was from the time when the park was open. My mind had an argument with itself. I REALLY wanted to get out of there but I also REALLY wanted to take a picture of that sign and road. And when you have to set up the tripod, get your composition, get your focus in pitch black, and then wait for a 15-30 second exposure…that’s no small task. But as you can see below I did it…:) I then packed up for the final time and made my way outside of the park. For those people out there who don’t understand Urban Exploring…it’s okay. I don’t expect you to understand it. For me personally it comes from a love of history. I love seeing things that have been frozen in time. It’s like a real life encyclopedia to the past. Six Flags is an amazing place. It’s been awhile since I’ve been there and from what I understand the city is moving towards finalizing plans to either let a private company renovate it, or have it torn down. Either way I’m glad I was able to get in there and document it as a way of preserving history. I hope you’ve enjoyed my post. Please feel free to share the post with others and don’t forget to watch the video!!! !